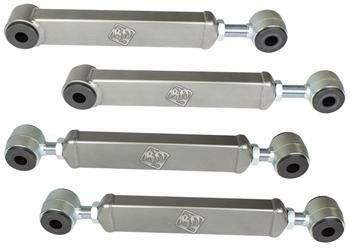 Stock control arms are known for bending and bushing deterioration which contributes to caster misalignment and steering problems. BD’s Control Arms are constructed with forged end links and are built Super Tuff to resist bending — over three times stronger than stock arms! The Control Arm bodies are powder coated and threads are zinc plated to prevent rusting. To help correct caster, bottom arms are fully adjustable on the truck while top arms only require the removal of one bolt to allow adjustment. Smooth and stiff Ultra Polyurethane bushings are used for extended life and are replaceable. Kit offers top and bottom arms or can be purchased separately.